We’re excited to introduce our newest team member, Jennifer Newman. Jennifer is a PhD candidate in Clinical Psychology. 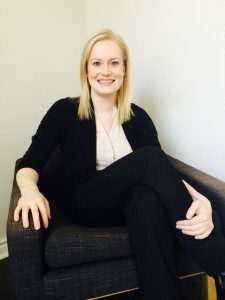 She has received extensive training in Cognitive Behavioural Therapy (CBT) and has worked with a wide range of client populations (i.e., adults, adolescents, children, and individuals in conflict with the law) experiencing a number of mental health concerns. Jennifer has experience in providing both individual and group psychotherapy and has a special interest in the treatment of mood and anxiety disorders, interpersonal difficulties, and emotional dysregulation. She has completed clinical training at Surrey Place Centre, St. Michael’s Hospital, the Centre for Addiction and Mental Health, as well as McMaster Children’s Hospital, and has worked with individuals in both inpatient and outpatient settings. Jennifer’s graduate research examines risk factors and correlates of criminal behaviour among various forensic populations. She currently holds a 3-year Joseph-Armand Bombardier Canada Graduate Scholarship from the Social Sciences and Humanities Research Council (SSHRC) for her doctoral studies, and has presented her research at both national and international conferences.